The NFL announced that Reuben Foster has been reinstated after investigation into domestic violence allegations. 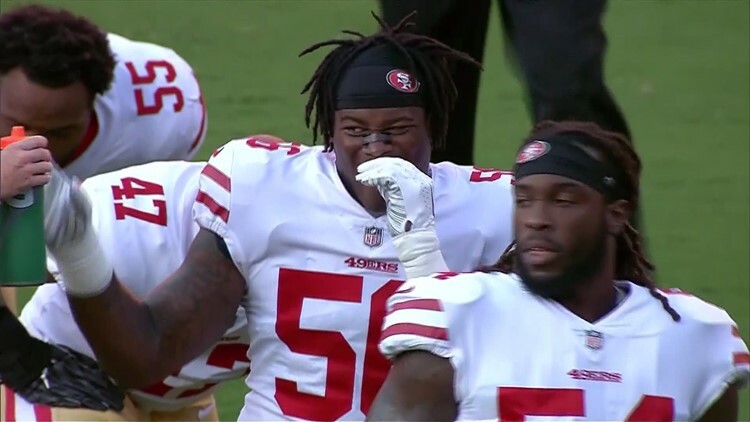 WASHINGTON — Washington Redskins linebacker Reuben Foster will be fined but not suspended following a November domestic assault charge, the NFL announced Friday. The league’s punishment will cost Foster two game checks, but he will not miss any games or practices. He will also not appeal the fine, according to Tom Pelissero of NFL Network. Foster was arrested on November 24 in Tampa, Florida, after police received a call from a woman who accused him of breaking her phone and slapping her in the face. The case was dismissed on January 3. Foster was released by the San Francisco 49ers on the morning following the incident and was claimed off waivers by the Redskins on November 27. He was promptly placed on the Commissioner’s Exempt List and did not play a single down for Washington in 2018. However, he will be eligible to play for the burgundy and gold in 2019. This is not the first time Foster has been embroiled in legal trouble since entering the NFL in 2017. At the time of his November arrest, he was serving two years’ probation for a weapons charge. Furthermore, he was suspended for the first two games of the 2018 season after being charged with second-degree marijuana possession and was also accused of domestic assault in February, 2018 by the same woman who accused him in November. Both charges were later dropped. Foster was drafted 31st overall by the 49ers in 2017. He appeared in 16 games for San Francisco over less than two seasons with the team, making 101 tackles.